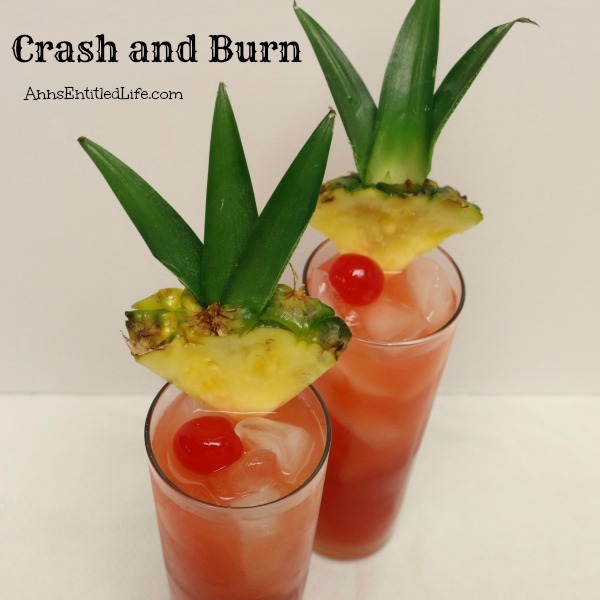 Five liquors combine with three juices to make this fantastic, smooth and very drinkable Crash and Burn drink recipe! 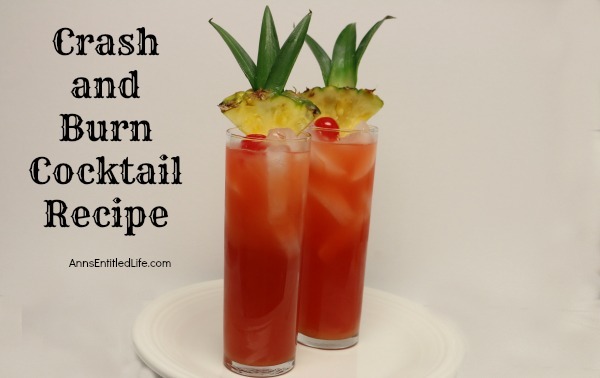 • Fill a tall cocktail glass halfway with ice. 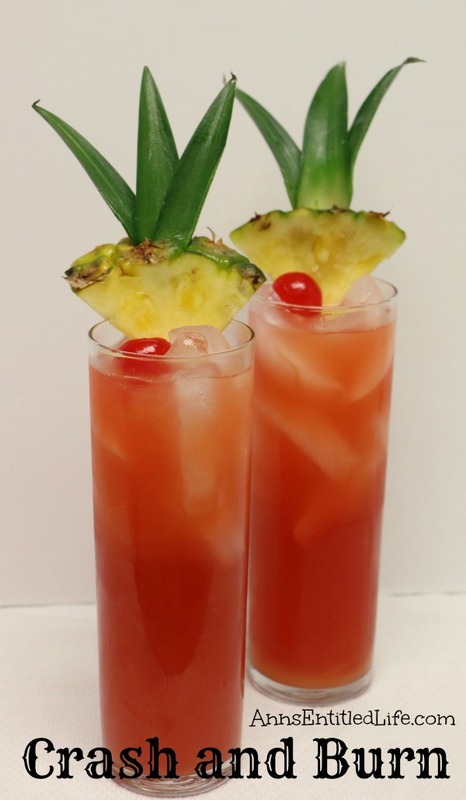 • In a cocktail shaker combine, 151 Rum, Triple Sec, Amaretto, Light Rum, Blackberry Brandy, Maraschino Cherry Juice, 2 ounces of Pineapple Juice, 2 ounces of Orange Juice; shake 10 times. • Pour cocktail over ice in tall glass. 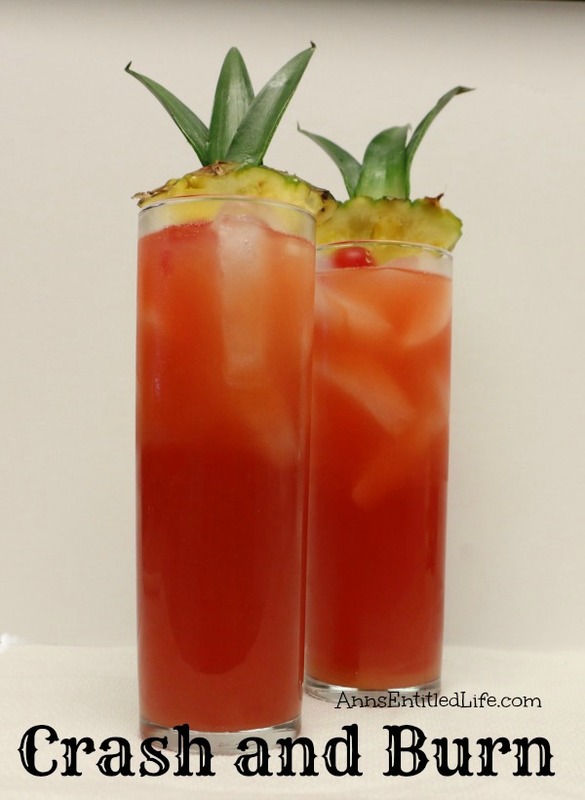 • Pour remaining Pineapple and Orange juices over the drink; do not stir. 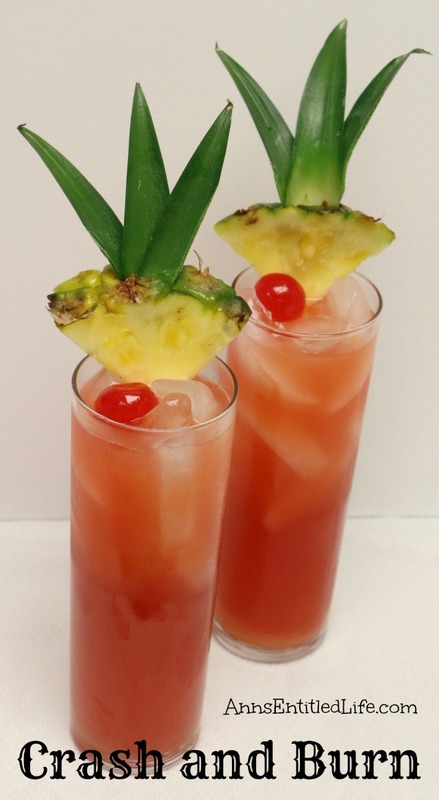 • Garnish with Maraschino Cherries and a Pineapple wedge. • To print the Crash and Burn Cocktail Recipe Recipe, click here. Hubby and I were having lunch at a restaurant a few weeks ago. 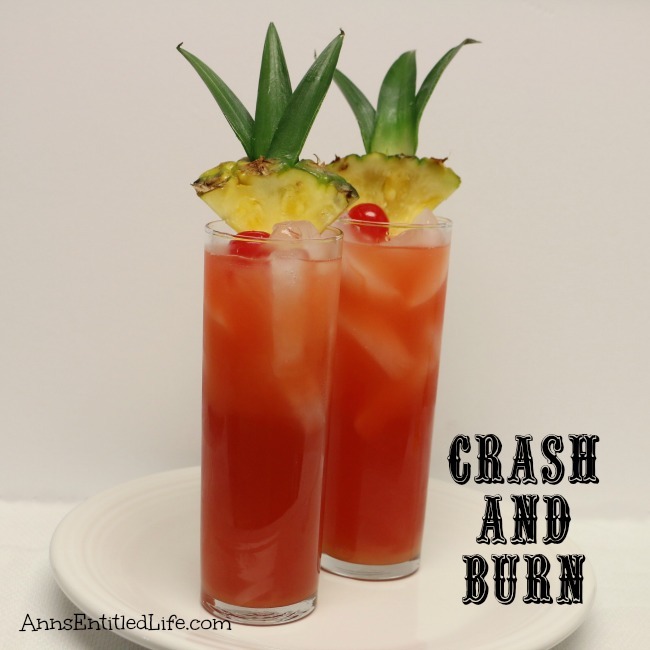 One of their specialty drinks is called the Crash and Burn. I thought it sounded intriguing, so copied down the ingredients, went home and made the cocktail. It wasn’t very good. So, I tried again, substituting ingredients, adding new juices, removing other listed ingredients until I came up with my version which I listed above. Now I stuck with the name because this went down smooooooooooth. Hubby said it tasted like an adult Hawaiian Punch. Yeah, that smooth. He wanted to crash and take a nap when he finished his Crash and Burn cocktail, I just wanted another one. I think one of us has built up a bit of a tolerance. This is one delicious cocktail. Truly. I just would make sure you are in for the day (or night) when making this as it does go down so smoothly, you will want a second. And then it will be nighty-night! This looks delish and I love the name! You must have had some fun coming up with the exact recipe 😉 I’d love to share this at my weekend features post with a link back to you. Hope that’s ok.
Photo + linkback (not the recipe itself) is A-Ok with me, Jenna. And thank you!